of The Inc Magazine "Best of the Web" Award for "Killer App"
Killer Apps applauds particularly innovative and muscular Web-based applications, the kind that remind us how much the technology makes possible. The best websites don't just work, they do work. And some perform their duties in ingenious ways. If you've conversed with a preschooler anytime in the past 10 years, you're familiar with Thomas the Tank Engine, a cartoon character that appears in Shining Time Station, a PBS program that mixes lessons in civility with arcane British train lore. In the world of Thomas, there is no higher compliment than to be called "a really useful engine." The winners in our Killer Applications category of the 2002 I Web Awards are that and more. Engines, by definition, drive action, and the services described here are no exception. These Web-based functions have helped companies boost sales, eliminate downtime, manufacture custom products, streamline operations, and better serve their customers. Their technological bulk is all muscle, comprising robust databases, tracking systems, configuration tools, and proprietary algorithms. Capability matters. Technology matters. But audience matters, too. The companies that built these applications are intimately familiar with their customers' needs and habits, and their sites reflect that understanding. When you come right down to it, that's what it means to be really useful. 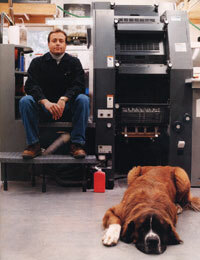 The way Andrew Field sees it, an idle printing press is like a half-full passenger jet. "When a plane takes off with empty seats, that's revenue lost forever," says Field, founder and president of PrintingForLess.com. "Same thing if I have employees standing around and no jobs scheduled for three hours." PrintingForLess.com (originally called Express Color Printing, Inc.), founded in 1996, handles complex color-printing jobs: 5,000 business cards, say, or 10,000 posters. There's not a ton of such work in Livingston, a town of 7,000 residents, and Field's travels around Big Sky country in the late 1990s failed to drum up enough sales to keep his first $500,000 press humming. By late 1998, he says, his company was "just plugging along" with $70,000 to $80,000 a month in sales. So in 1999, Field sought to augment revenues by going on the Web. His business's site doesn't compete with companies like iPrint.com, which gives its customers the option of designing their products on-line. Field's small-business customers submit electronic files with their existing designs, whether for the letterhead they've used for decades or for a brand-new brochure they've just whipped up using Microsoft Publisher. After totting up the cost on an on-line calculator, they point and click to upload their files through the Web site, or mail them in on a CD or a Zip or Jaz disk. Meanwhile, PrintingForLess.com's Web site now brings in 95% of the company's revenues, eclipsing the storefront business. "Even our local customers decided they liked the Web better," Field says. "It's become the tail that wags the dog."